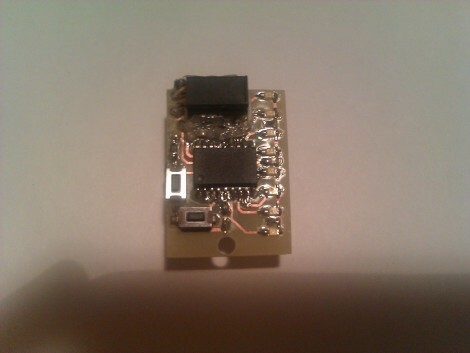 [Augusto] wrote in to tell us about his keychain-sized persistence of vision project. He built the original prototype on some protoboard, using a PIC 16F627 to drive eight LEDs. Synchronization is managed by a tilt sensor on the board that starts the strobing to match the direction the board is traveling. This is a similar setup as the POV device that used an accelerometer, but it should be quite a bit easier to code for the tilt switch. Once [Augusto] had the hardware dialed in he set to work laying out a surface mount design. The two AAA batteries were traded for a single 3V coin cell, which is on the back side of the board you see above. This is his first attempt at working with surface mount components and we think he did a great job. Check out the POV in action in the video after the break. You can see the text wrapping at the end of the swing; this also happened to the first (and only) POV device I ever build, which used a microswitch with a little weight to sense the frequency of the swing. The key observation is that the switch does not change it’s state at the end of the swing, but around the halfway point, because that’s when you begin decelerating your arm. If the software accounts for this, you can suppress the wrapping at then ends. Also, the speed isn’t constant throughout the whole motion; it’s far lower at the ends, compressing the text. The easiest way to prevent that is to add a few spaces to the beginning and end of the text. Good points Sparky, but I don’t think the text compression is enough to warrant adding spaces to the characters, or even columns withing each character. It would need some fine tuning on the column timing based on an acceleration profile perhaps. An accelerometer on the board would be a nice upgrade from the tilt switch to facilitate this. Just account for it in code. Make it gradually stretch towards the ends of travel. Very cool. I think you next version will have and accelerometer too! Nice work. Pretty cool little board. One thing I notice is the keychain hole looks pretty close to the board and it could break with enough force. I’d make the hole a little smaller and move it away from the edge a tiny bit. chris liked kicad StepUp script hacks MCAD world!.